At Facilitec West, you can count on our services to consistently exceed your expectations. All work is performed by our highly trained, professional staff. No subcontractors, ever. All of our services meet or exceed NFPA 96 standards, so you can be assured to pass inspection every time. We provide a Grease-Free Guarantee and follow up our services with a call, to make sure there is nothing else we can do to meet your needs. We also have 24-hour services available for when emergencies come up. Take a look at our services below and give us a call. We have flexible scheduling and are eager to take on more clients who are as concerned about quality results as we are. Hood Cleaning – Commercial kitchens that don’t clean their exhaust hoods regularly are at a much higher risk of equipment failure and fires. To maintain your equipment working at its peak performance, prevent costly grease fires and stay NFPA 96 compliant, schedule your maintenance today. Grease Containment – As grease travels up your exhaust hood it vents out to the roof. To prevent grease overflow, code violations, and fire hazard, you need a rooftop grease containment solution. 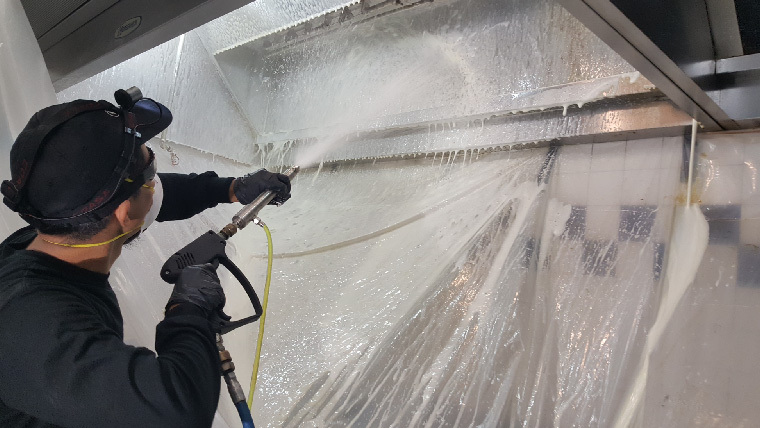 Surface Cleaning – Beyond your exhaust system, stay code compliant and hazard-free with our surface cleaning services including concrete pads, dumpster pad washing, metal awnings, exterior building facade, sidewalks and drive-thru pressure washing. Maintenance Program – A customizable maintenance solution that combines hood cleaning and rooftop grease containment services. Typical service includes regularly scheduled cleaning, including checking for any damages or needs for repairs. We clean as well as resolve problems with noisy operation, poor ventilation and more. Key Access Program – An overnight hood cleaning service that makes cleaning more convenient than ever. With secure access to your business’ key, we service your facility at a time that is easier on your schedule. No need for your business’ working hours to be interrupted. All of our services meet or exceed NFPA 96 standards. We are committed to keeping your facility compliant and safe. Whether you are ready to schedule one of our free assessments, or you simply have a few more questions, contact us today. We believe in integrity, accountability, and results. Call us today for service from a company you can trust at 888.463.2293.